Wow! gorgeous fish! What size tank? thats a great mix of fish! the tank is around 75US gallons with 25 fish - its 130cm / 51in long. Because the tank is busy I've got good filtration - a Eheim pro 2028 (for tanks up to 160 gallons) and an internal Fluval (for tanks up to 50 gallons). I do a couple of water changes a week as well. wow very nice one thing your tropheus... should not be in there. They are veggi eaters and dont need protein because it will kill them by bloat. One more thing whats that silver cichlid thats on the top left with black dots? the tropheus is nearly 5 yrs old and is doing very well - its doubled in size since I have had him.. as long as you give a good varied diet - including the frozen blocks and spirulina, tropheus should be ok, it dosnt hurt to treat the whole tank with anti-bloat tablets now and then though, these tablets don't effect the bacteria in the tank. The silver fish with black dots is a rostratus - when fully coloured they are the most stunning cichlid to have - metalic blue, black red and green...mine has just started to get a hint of red and green and the black is becoming more defined, fingers crossed its going to colour up - though they can be viscious when fully coloured. 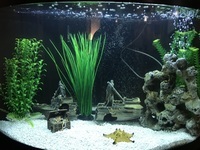 Very nice,i also have a mixed african tank with a tropheus pemba and have been told exactly what justin said,but the same as u ben i have no probs at all and i agree a crowded tank makes for less aggresion. Looks great. post a pic of the crab! What is your fish list? What a beautiful combination of fish you have Ben. Excellent a blast from the past!!!!!! Beautiful!!! dont know why but it looks more like 8foot than 51" !! Never kept eyebiters...do they not bite eyes then? Svidja mi se MIX ! Very cool also would like to see a picture of a crab? 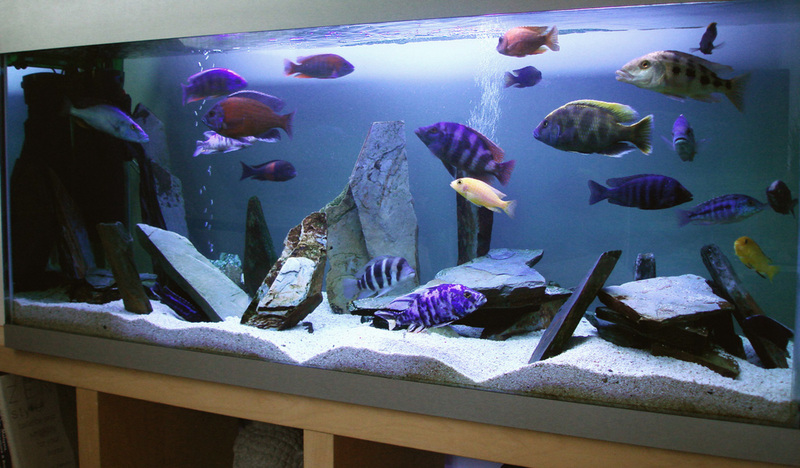 whats that purple and white blotchy fish called in the front of the tank??? and how much gallons?? Lets see a new picture of this.. Very cool tank. I am truly inspired.